A) Tokyo Metro Hibiya Line or Tokyu Toyoko Line, Nakameguro station (Use "Main Exit") about 16 min walk, flat & uphill path. B) Tokyu Denen Toshi Line, Ikejiri-Ohashi station (Use "East Exit", right hand side of the ticket gate) about 13 min walk, flat & uphill path. Main Exit of Nakameguro Station is facing Yamate-dori Avenue. When you get out of the ticket gate, turn left to walk along the avenue for 10 min. After crossing "Aobadai 1" intersection, you will see a convenience store, "FamilyMart" to your left. 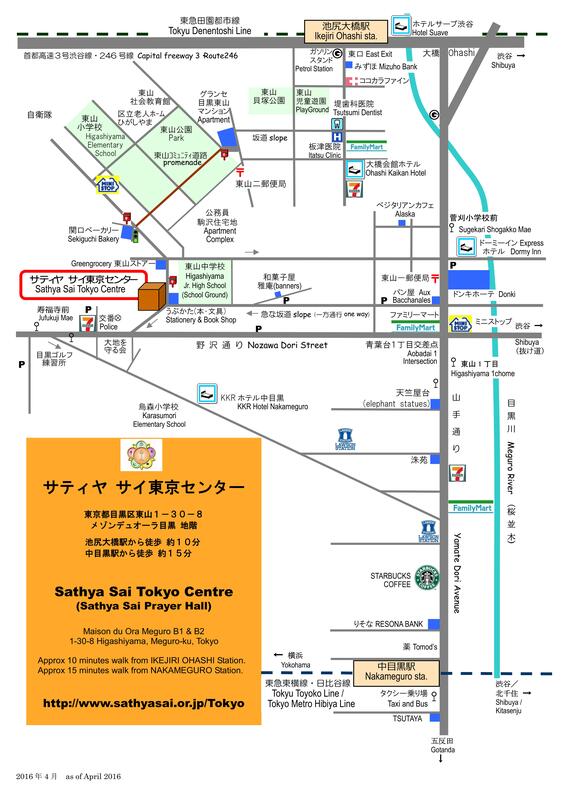 Walk pass it and turn left at the first corner (You will be on an uphill path, lie to the Tokyo Sai Center from the Yamate-dori Ave.). After 5 min walk, you will see a school playground of Higashiyama Junior High School on your right. Walk straight along the pathway, and then you will see a beige, three-story building, "MAISON DU ORA MEGURO" in front of you. Push open the black iron door at the right side of the building and walk down the stairs to B1, the entrance of Sathya Sai Prayer Hall. Use "East Exit", right hand side of the ticket gate to walkup to the ground level. You will see Route 246 in front of you and a petrol station on your left side. Turn left toward commercial street between the Exit and the gas station. As soon as you walk into the street, you will spot MIZUHO BANK (white and blue bldg.). Walk straight about 200 meters; you will come by a crossroad with "ITATSU CLINIC" (内科　板津医院) on your right hand side. Turn right just before the clinic and walk uphill till the end of the street. Turn left to a junction of three streets. Take the middle promenade (東山コミュニティ道路) on the left side of a park (landmark: red post box). Walk straight for 400 meters, and then you will run into a traffic light. Walk pass the crosswalk and head towards the left side, you will get to Y-shaped intersection. Turn right at the intersection (landmark: greengorocery). Walk about 30 meters; you will then find a beige, three-story building, "MAISON DU ORA MEGURO" on your right side, stationary shop, "うぶかた" on your left side. Push open the black iron door of the building, walk down the stairs to B1, the entrance of Sathya Sai Prayer Hall. Tokyo Sai Center is 3-6 min walk away from bus stations. Main Exit of Nakameguro station is facing Yamate-dori Avenue. When you get out of the ticket gate, turn right to a taxi terminal.